Noticing a chair on the patio in need of renovation, I went to my material cupboard and found I still had some of the upholstery fabric left with which I had previously re-covered it with years ago. It was a simple matter of removing the screws holding the seat on, then cutting a large piece of material out. This time I added half an old pillow underneath for extra comfort. 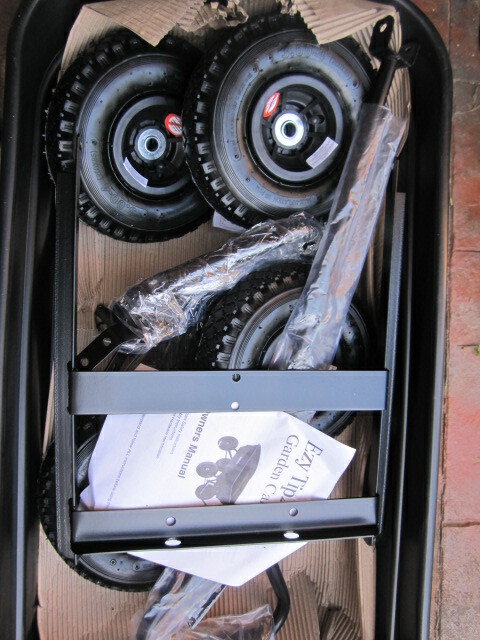 With my trusty staple gun, the job was finished in almost no time. I even added a pretty edging of ribbon on the underside. Mini project completed! In 2008, on our trip to Thailand, we did a two-day class at Pum’s Cooking School. 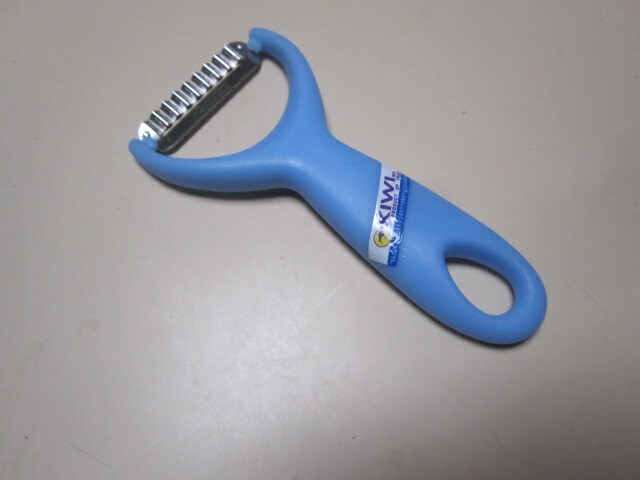 We bought a great little wavy peeler there, which helps cut vegies decoratively. 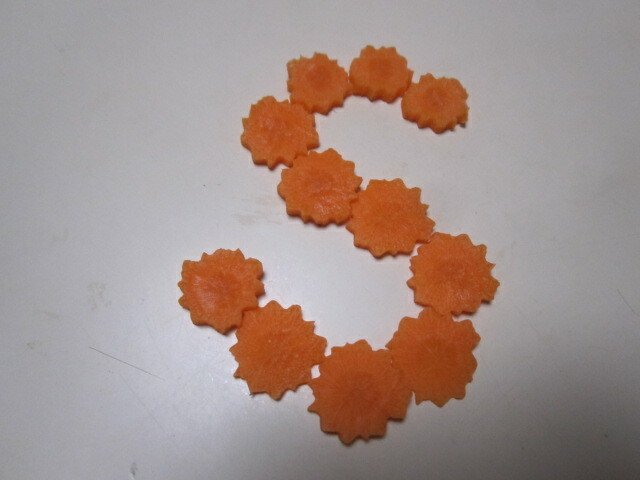 It is very useful for shredding carrot for a soup or salad. 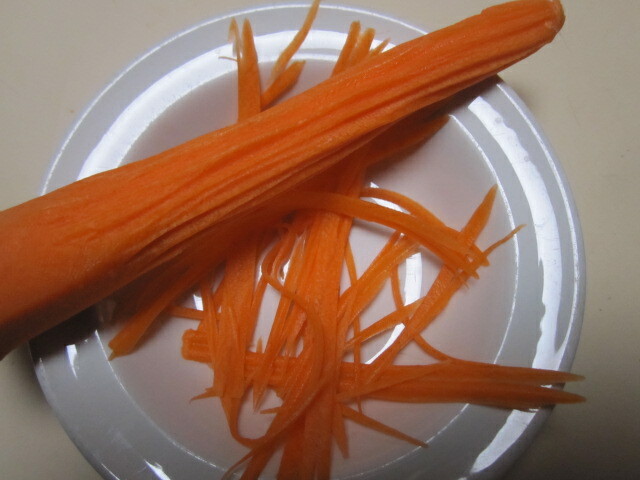 If you shred evenly down the entire circumference of the carrot, when you slice that carrot it has a beautiful edge like a flower, and presents well raw or cooked. 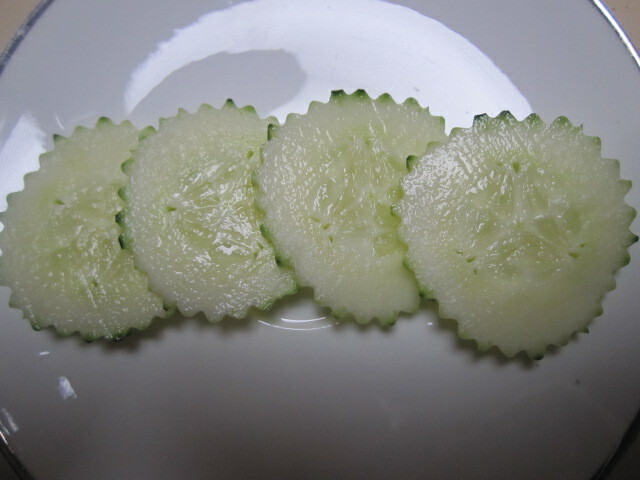 It works well with cucumber too. 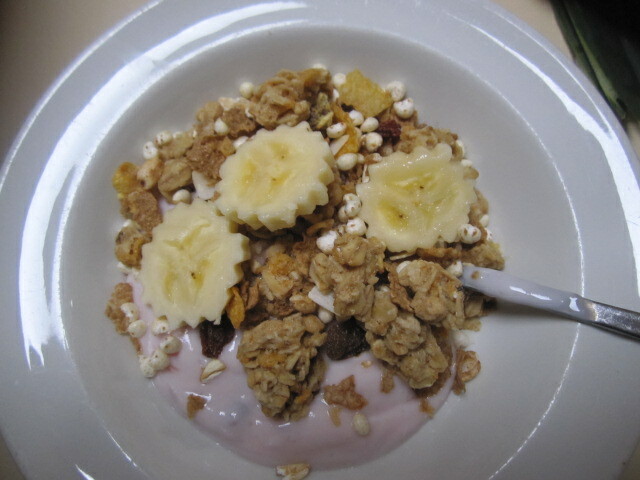 As I was preparing the photos for this post, I was also getting breakfast ready, which made me wonder if it could work on bananas too. The shredded outer part could either just be eaten or used in a smoothie. The good news is that you don’t have to travel overseas to get one, as they are readily available at Asian grocery stores right here in the Land of Oz. Anyone who knows me knows that I love gadgets. 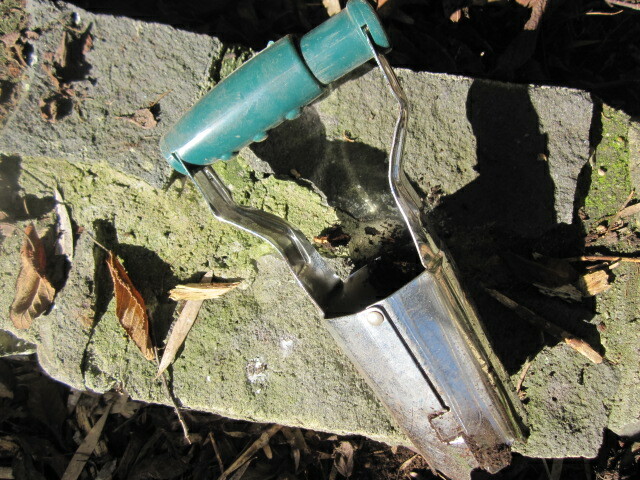 The bulb remover is a handy one for the garden, and can be used for planting and also transplanting bulbs. 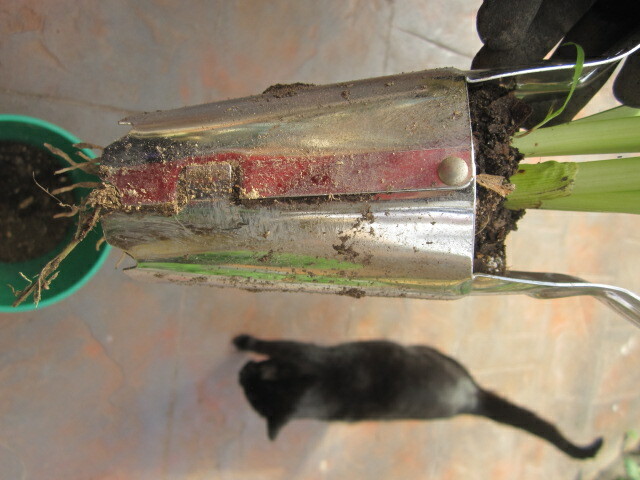 Grasp the handle and press the edges firmly down into the soil. 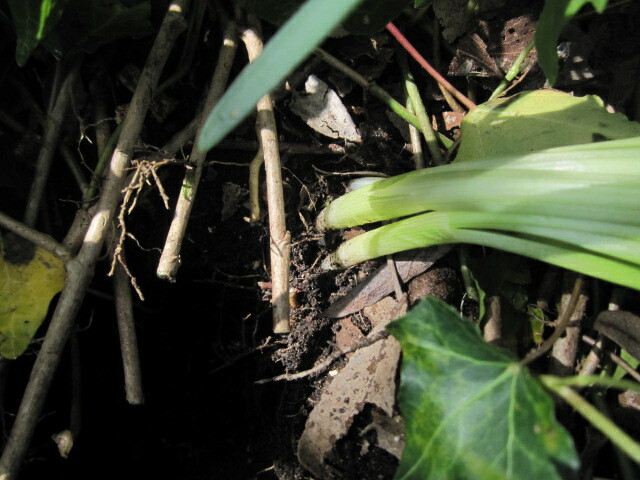 Turning it as you push helps loosen the dirt. 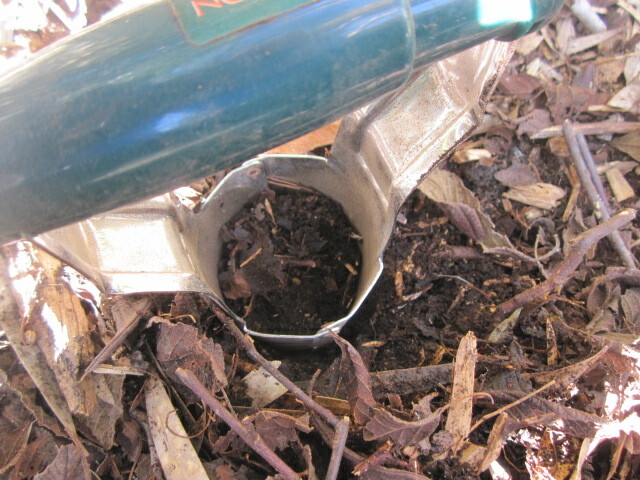 Pull it upwards and the soil comes up too. 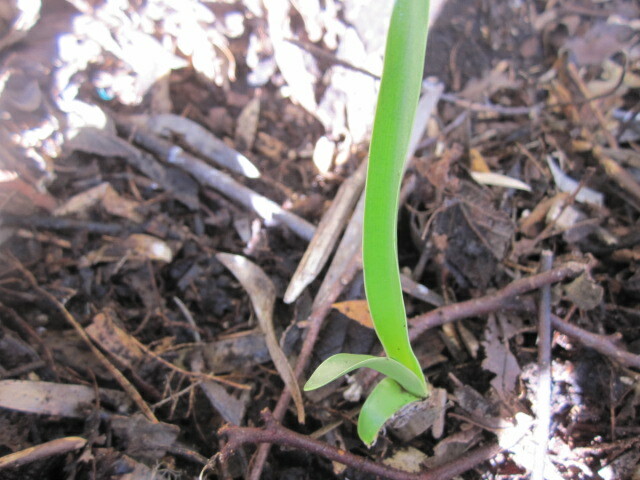 I’m not sure what this bulb is, but it was in an area that I wanted to put down some more pebbles, so I took it out and moved it to another spot. 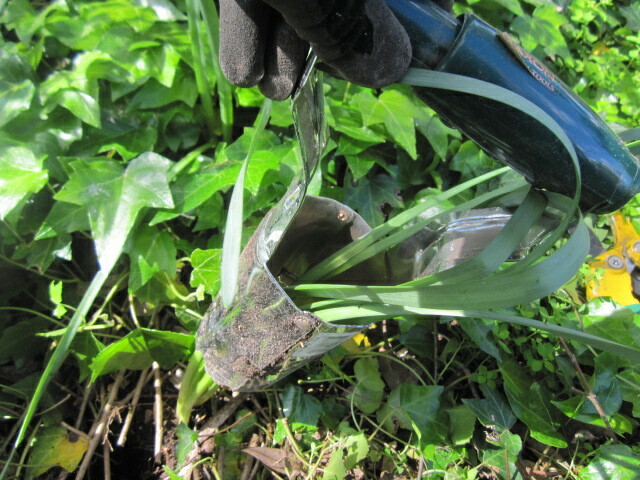 To remove the soil that is contained in the bulb remover, press the edges of the handle together to release it. Simple and effective. I have just repainted half, or maybe one third of the kitchen/family room. Since I was using the same colour as before (Burnaby, a nice creamy cream), I chose only the worst walls to tackle. Most of the walls are covered with a lot of pictures, so you can barely see them anyway. Using this approach, the whole area gets to look refreshed. Earlier, I had also rearranged pictures and ornaments that provided a new look anyway. Once you take something off the wall, it gives you pause to have a good look at it and decide if it still works. We get so used to looking at the same things we take them for granted (a little bit like spouses I think). 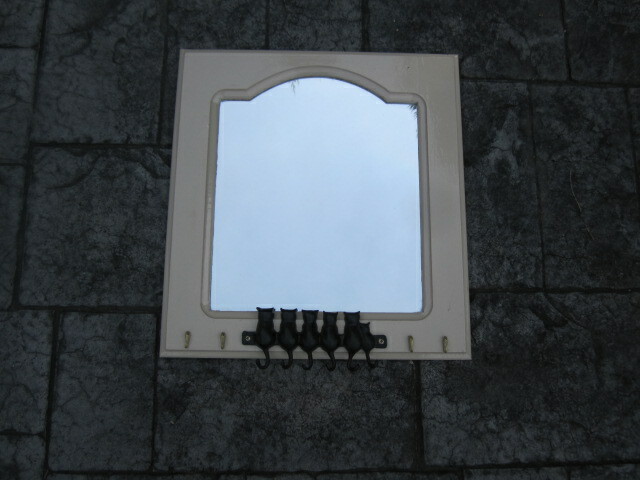 One such item is the mirror on which we hang our keys. 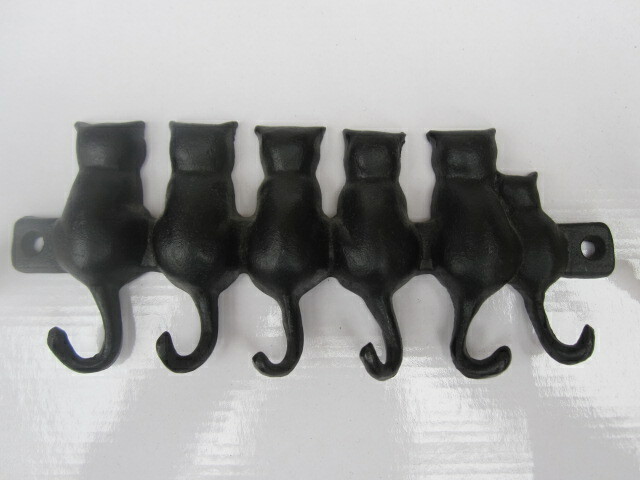 I have now revamped it with a gorgeous row of little black cats, a souvenir from our trip around the world last year, and some better looking brass hooks, which has given it a new lease of life. As far as husbands go, mine is a keeper, and in the same vein, our planned trip to Thailand at the end of October should give our relationship a new lease of life too! 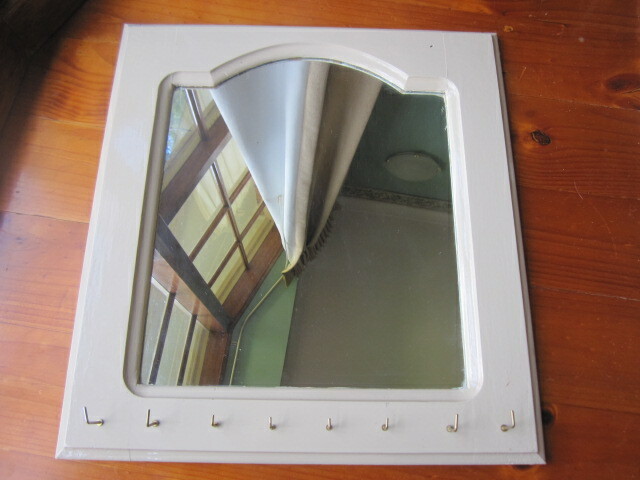 It’s quite difficult taking a photo of a mirror without anything in it and avoiding reflections of any kind. The before shot I took by placing it on the floor, but for the end shot I took it outside and laid it down on the paving, with only the sky above. It almost looks like it’s a stone wall. Once, years ago, in another galaxy far far away… No wait a minute, in another phase of my life, I was a Tupperware lady. 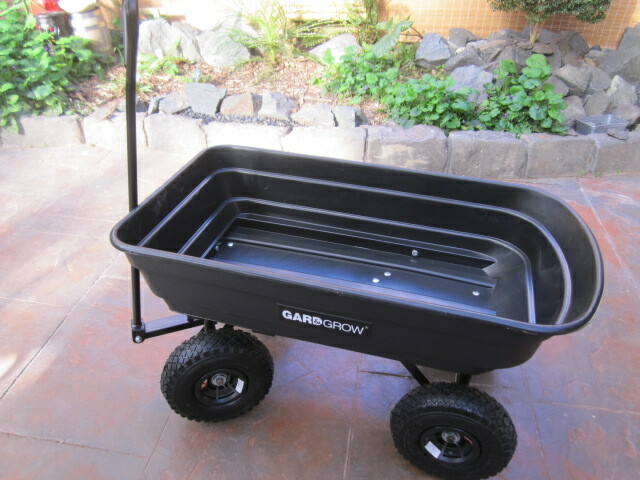 In fact, I became a Tupperware manager and had a company car for two years. But that of course, is a different story. I am introducing a new category to my blog, entitled GADGET GIRL, and from time to time I will tell you about different gadgets I use. At one stage I planned another blog covering gadgets, but realised I was spreading myself a little too thin, so why not incorporate some of them directly here? 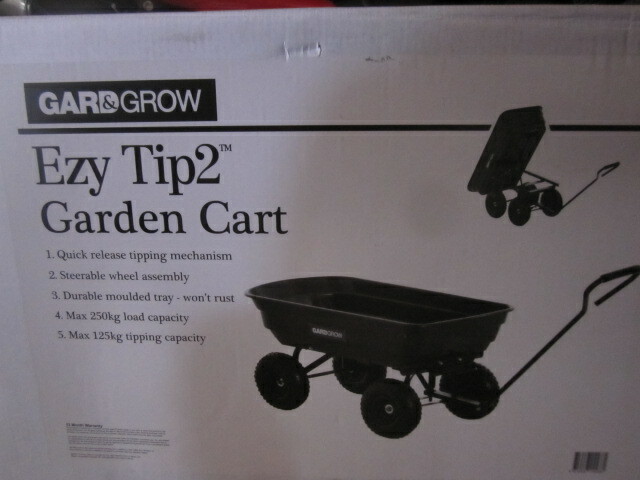 They certainly fit into the broad theme of “House and Garden”. Usually I edit my work a fair bit, although in today’s blog I am prattling on a bit, as I do from time to time, but it suits the name princessprattles.com. 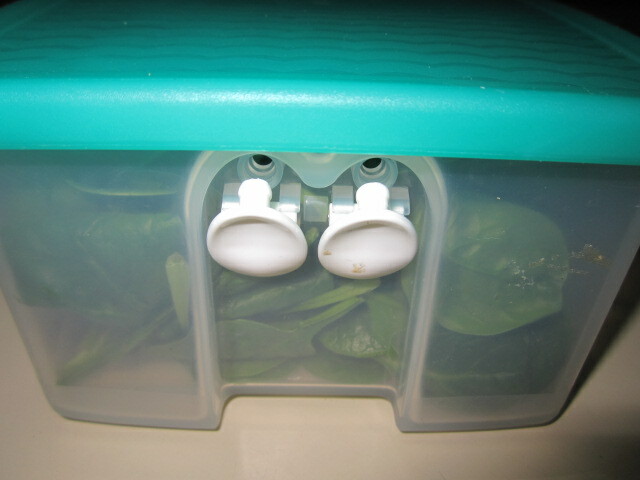 At one of my demonstrations, I was showing the ladies at the party the fabulous Fridge-Smart containers, which have little vents on them to control the amount of air particular vegetables require in the fridge. 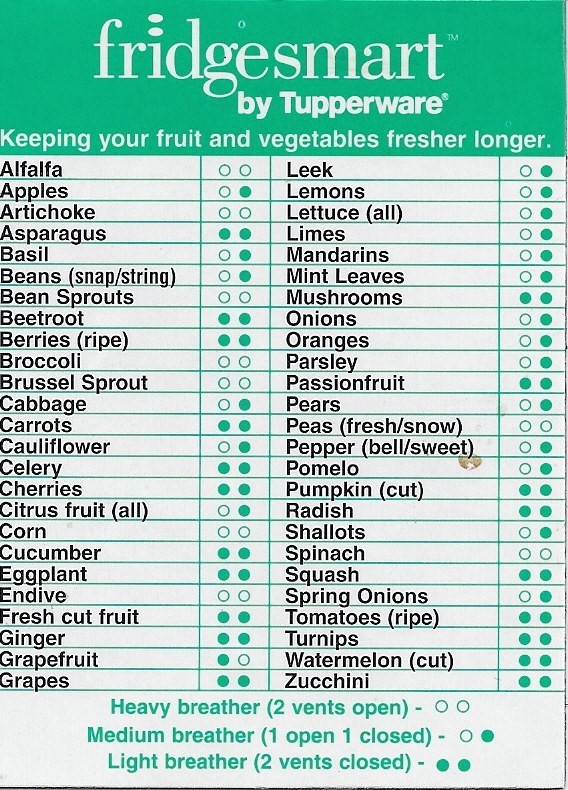 For example, did you know that broccoli is a “heavy breather” so needs both vents open, while with celery both vents are closed. There is a magnet that tells you which is which. 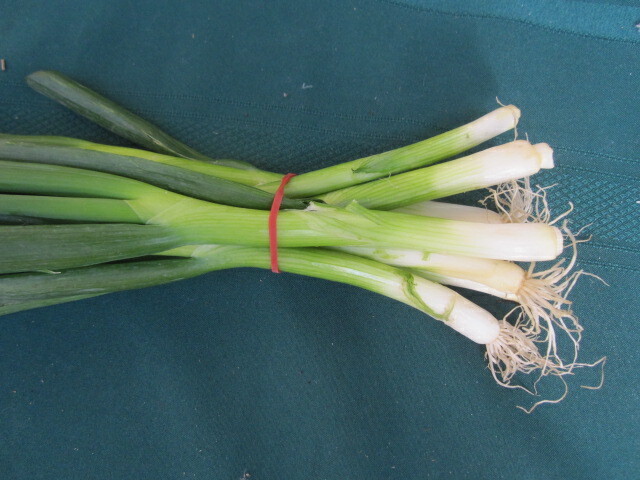 Spring onions are obviously undecided, as they utilise one vent open, and one vent closed. A lady pointed out that she doesn’t keep them in the fridge at all, but plants them in the garden, where they keep growing for ages. 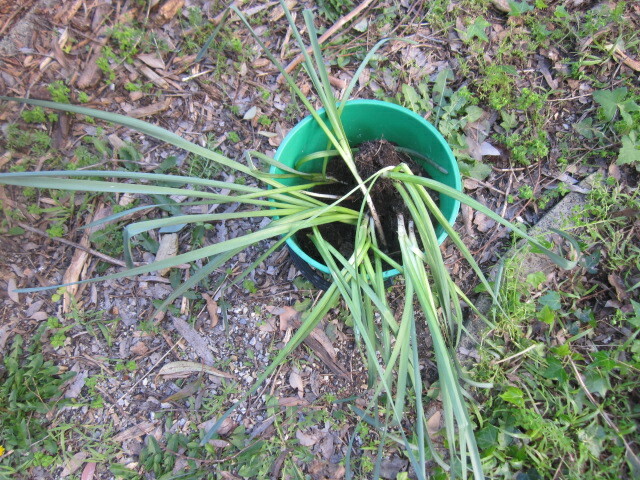 I found out she was right, and have been doing that ever since, but this week my plans were foiled, as I bought a bunch from the supermarket, but some of the roots had been chopped off. Oops! 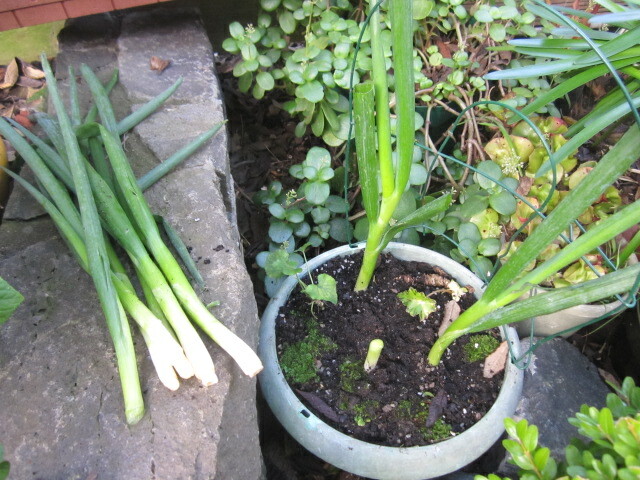 Never mind, I managed to plant a few.